I waste far too much time. 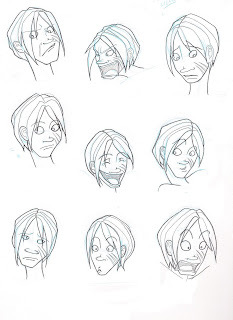 Alright so, just some expressions I reworked, mostly for line variety, but these are better in terms of execution too. I've been up too late, my eyes are stinging. I must've drawn up four rotation sketches today, and I was getting so BLASTED frustrated, I wound up throwing them all out, and deciding I am going to use the wonderful invention of the lightbox, and just rework my old rotation as opposed to killing myself over a brand new one. lol don't worry about it! You'll get through it all as well as hang out with your sister for a bit. I believe that you will do great and will have lots of fun!